So I was reading “A Mathematician’s Lament” by Paul Lockheart (http://www.maa.org/devlin/lockhartslament.pdf). The document laments the teaching of math in public schools, and has all sorts of dignified grumbling within. It’s an interesting read. 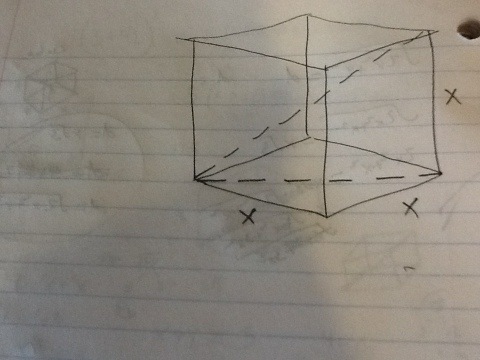 Later in the essay, he gives several sample problems to replace the less interesting ones, and the suggestion to calculate the diagonal of a cube caught my eye. I had never done anything like that before. 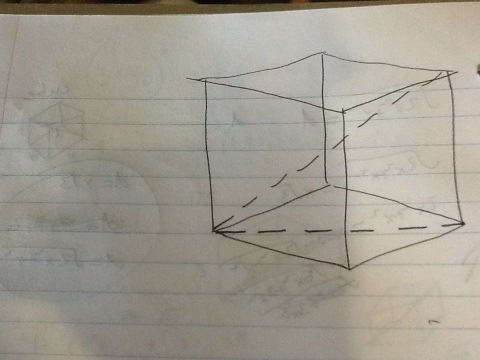 I didn’t take a traditional geometry class, it was an online thing. Maybe that’s why I hadn’t calculated it before. Regardless, I set to work. 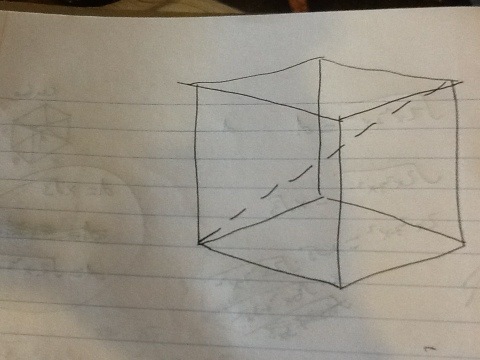 Well, I suppose I should draw a cube first, and draw the diagonal. Okay, this is promising. Before I go any further, I should give the sides a length. Let’s call them x. If I solve for that bottom dotted line, I’ll be able to solve the diagonal! 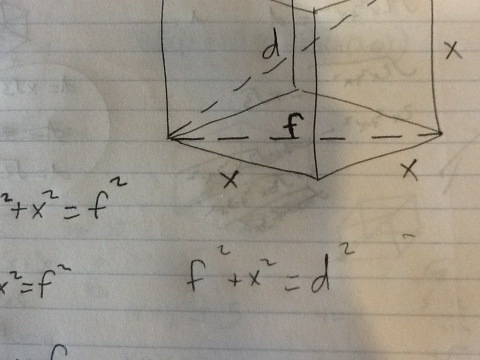 So I’ll call that thing f.
Alright, now let’s solve for the diagonal. Well, after labeling it d.
I bet we can condense that, though. Hold on a second. 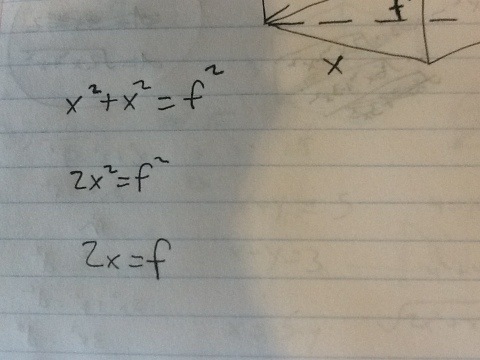 What if instead of putting a square root on both sides, I combined the xs? 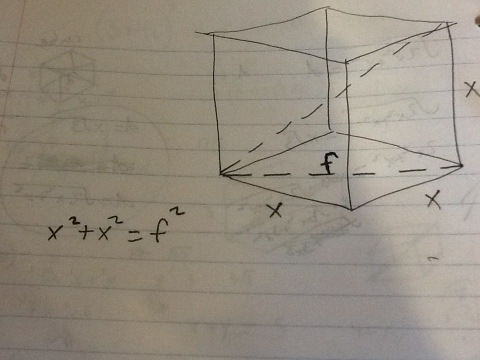 So I can find the diagonal of a cube by multiplying the side length by the square root of 3? That’s pretty awesome. 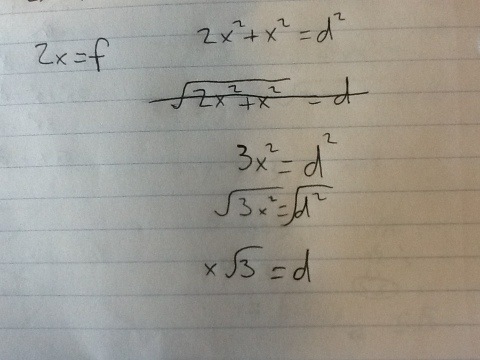 My math teacher, Ms. Ogden, gave me the idea for the last step. I had already compared the diagonal to the side of several squares, and found the whole square root of three relationship. 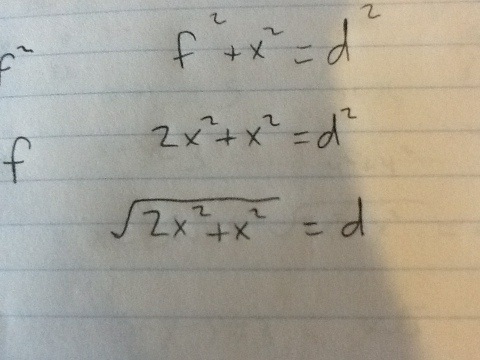 I just had trouble algebraically proving it. So, credit to her for fixing my math.